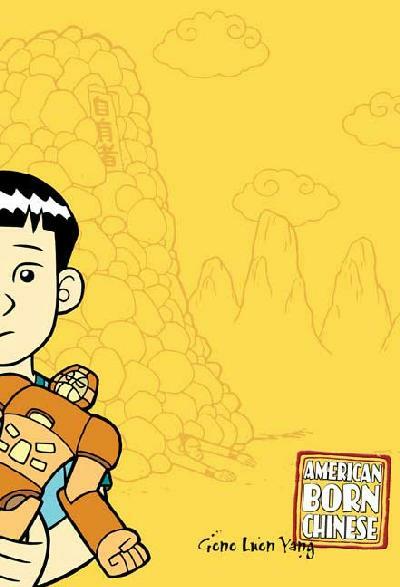 This acclaimed graphic novel by Gene Luen Yang tells three interlocking stories. There’s the mythic tale of the Monkey King, who spends his days studying Kung Fu but who cannot escape his monkey-ness. There’s Jin Wang, the young Chinese-American boy struggling to fit in. And there’s “Everyone Ruvs Chin-Kee,” a sitcom-style story of American teenager Danny and his extreme embarrassment at the arrival of his cousin Chin-Kee, a walking Chinese stereotype. Although this book has been read and admired by many and talked about a lot, I’ve managed to avoid most of the talk about it and only pick up on the admiration. What I told you in the paragraph above is just about all I knew going in, and that was a good thing. There are a few aspects of the book that I think are most effective if you go in without knowing they are coming, so I won’t say more. I will say that I enjoyed the book quite a lot. All three storylines had their compelling moments, and even the parts that made me uncomfortable had a purpose. Including a character like Chin-Kee is a risky move, but I think Yang pulls it off. Jin’s story is, for the most part, a typical coming-of-age story, with the added element of identity acceptance. The story that I liked more than I expected was that of the Monkey King. There were some compelling spiritual elements there that I appreciated a great deal, even if the story itself was rather crude at times. The crudity fit the Money King’s character. But it’s in combination that the stories really work. Together, they offer a clever spin on the topics of ethnicity and self-acceptance. If you haven’t read it already (and I suspect most of you have), do yourself a favor a give it a try. I read it in less than an hour, so we’re not talking major time commitment here. Even if you don’t love it, I don’t think you’ll regret the time spent with it. I agree that he does manage to pull Chin-Kee off very well. The whole using-stereotypes-to-defeat-stereotypes thing can be problematic, but Gene Luen Yang does it with sensibility and intelligence. I’m so glad you enjoyed this! It was a risky choice, and I think younger readers might need guidance to understand what he’s doing, but I thought it worked well. Lately I’ve become a huge fan of going into books knowing as little as possible about them. I find that this does a lot in terms of managing my expectations, and keeping them from being unrealistically high. Plus there’s something so fun about a book revealing itself to you over time! I don’t think I’d heard of this one (though the cover seems familiar), but it definitely sounds like an interesting read. I have mixed views on how much I want to know about a book going in. If all I hear is how great a book is, my expectations may get raised too much. I kind of like to know details about how it’s wonderful (and how it’s not) so my expectations will be pointed in the right direction. But then sometimes I enjoy reading a book cold, with no information at all. I tend to reserve that practice for reliable authors, so at least I’ll know my time won’t be wasted. When I first started exploring graphic novels, this is one of the titles that came up a lot as a good place to start. You’ve convinced me and I’ll get my hands on this one this fall. A great introduction it would be, indeed! Today I went to the library and saw this on a display. I knew you had a review that I was going to read tonight but yet I still didn’t check it out. I’ll have to get it next time. I know, graphic novels are such quick reads. I really should read more. Glad you can recommend this! I do hope you enjoy it! The nice thing about a graphic novel is that even if I don’t enjoy it much (and I’ve enjoyed almost all of the ones I’ve read), I don’t resent it for wasting my reading time! This one was an especially quick read. I read this last year and was a bit disappointed. I don’t know why I didn’t enjoy it as much as everyone else. I was just a bit put off and disinterested. That happens to me sometimes, too. Sometimes the book just isn’t a good fit, for whatever reason.